28 Days Later was a 2002 British film directed by Danny Boyle. Do you remember watching this Zombie flick back in 2002? Well millions of people do and what is the lure. The gruesome graphic scenes, bllod crazed half dead zombies. Does it give some kind of relied that atleast we are not as bad as them? 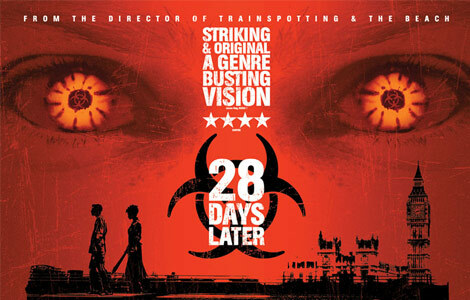 28 Days Later was a film about what happens after the breakout of a highly contagious virus. The story is about the lives of those who survive, how would they feel, how would they survive, what difficulties would they face. The plot depicts the breakdown of society following the accidental release of a highly contagious virus and focuses upon the struggle of four survivors to cope with the destruction of the life they once knew. Zombies films were nothing knew even at this time of release but this brought a fresh take on the genre using young actors giving it a modern day setting. It wasnt just about the crazy undead killing and eating there is a good story plot too. Viewers will get a chance to watch this popular movie on the big screen again at Secret Cinema, who have announced they will make their first foray into horror films with 28 Days Later.